Tehran recently expanded its bus rapid transit system. Photo by Francois Bouchet. 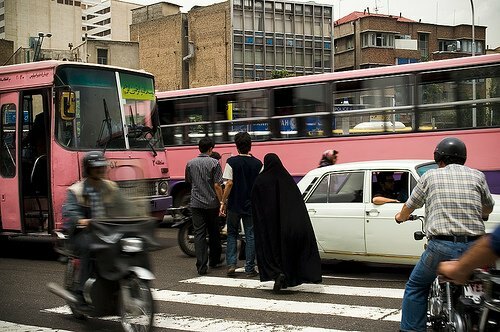 Tehran, Iran was the second runner-up to this year’s Sustainable Transport Award winner, Guangzhou, China. Event moderator Enrique Peñalosa called the city a model for others because of its aggressive policy aimed to successfully implement a broad set of new transportation options. Tehran is a massive city—one of the densest and largest in the world—and the magnitude of its environmental and mobility challenges is no different. Pollution is such a concern that the government periodically declares holidays because of poor atmospheric conditions, which are exacerbated by the low-lying valley where Tehran lies. The government has taken on a bold set of initiatives in order to deal with pollution and a slew of mobility and demographic problems, including “peripheral boomtowns,” rising rates of car ownership (especially of older, more polluting models) and heavy traffic. In 2009, Tehran had 159 kilometers of metrorail. In 2010, the country added another 77 kilometers to a metro system that now carries about 2 million passengers per day. The city has also invested heavily in a bus rapid transit (BRT) network of 100 kilometers that transports 1.8 million passengers per day. Mayor Mohammad-Baqer Qalibaf, who spoke at the Sustainable Transport Award ceremony via video, has seen a measurable impact of his efforts to construct rail and other transit projects in the city. It is now faster to get around certain parts of Tehran using the metro than driving a car. And now, “rates of construction of the mixed light and heavy rail system just recently seem to have eclipsed freeway construction, as city planning officials have realized that an auto-centric approach has thus far failed commuters,” according to a recent post on TheCityFix. Perhaps a sign of his success, the Mayor and former presidential candidate in the 2005 election was barred by the Iranian government from attending the 2011 Sustainable Transport Award in Washington, D.C. It is not clear why Qalibaf was denied an exit visa, given that the speech was an opportunity to introduce national achievements and prove the efficiency of Iranian management, wrote an Iranian daily newspaper. On video, the city mayor did share a few words on the city’s achievements. He said a human-oriented rather than vehicle-oriented city will pave the way for peaceful sidewalks, accessibility to facilities and pollution reduction. Besides expanding metro and BRT, the city has incorporated an integrated electronic fare system in its three-year-old BRT system. The Institute for Transportation and Development Policy (ITDP) estimates that passengers on the new BRT lines “received a 24% and 42% time savings respectively on their trips” since the new lines were put in place. And perhaps one of the most significant advances in sustainable transport has been Tehran’s implementation of congestion pricing, in an attempt to curb rising rates of car ownership. It remains to be seen, however, whether the pricing policy has reduced traffic and whether funds from the charge will be used to support public and non-motorized transit. Additionally, the city has developed a bike share system that includes 12 stations in one of Tehran’s 22 administrative districts. Currently, the bike share system bars women from riding. At the end of his video speech, Qalibaf said that he looks forward to exchanging information with cities worldwide. The possibility of knowledge sharing among organizations in countries that typically do not work together (much less exchange information) is an exciting development.